These maps reflect the ratings of a number of quantitative and qualitative forecasters, as well as some consensus projections. Click or tap any of the thumbnails for an interactive version that you can use to create and share your own 2018 Governor forecast. A consensus outlook for the 2018 gubernatorial elections based on the current ratings of Sabato's Crystal Ball, The Cook Political Report, and Inside Elections. For purposes of this map, only states rated safe by all three of these forecasters are shown in the darkest shade. Use this map as a starting point to create and share your own 2018 forecast for this year's 36 races for governor. The states shown in tan are those likely to be the most closely-contested among the 36 gubernatorial elections held in 2018. This map may change over time as the dynamics of each race (e.g., party nominees and the overall political environment) warrant. 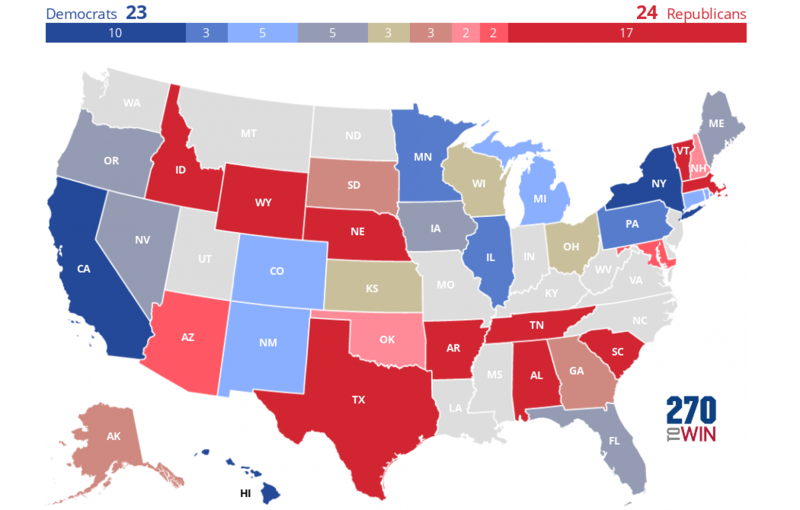 The final 2018 governor race ratings from Sabato's Crystal Ball. 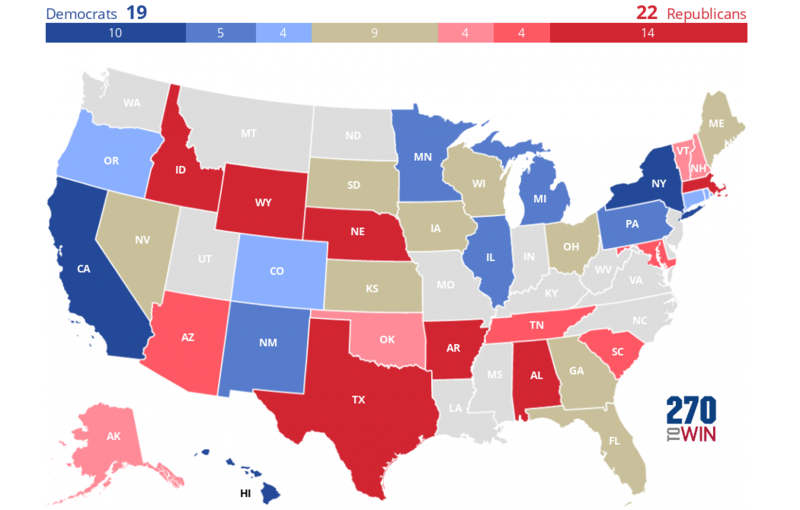 Use this as a starting point to create and share your own forecast for this year's 36 gubernatorial elections. The final 2018 governor race ratings from Inside Elections (formerly The Rothenberg & Gonzales Political Report). Use this as a starting point to create and share your own forecast for this year's 36 gubernatorial elections. The final 2018 governor race ratings from The Cook Political Report. Use this as a starting point to create and share your own forecast for this year's 36 gubernatorial elections. This is a governor forecast map derived from the probabilities associated with the FiveThirtyEight Governor Forecast (Classic Version). Use this map to create and share your own forecast for this year's 36 races for governor. The final 2018 governor race ratings from Politico. Use this as a starting point to create and share your own forecast for this year's 36 gubernatorial elections. Final 2018 gubernatorial race analysis and forecast from Louis Jacobson who has handicapped elections since 2006, most recently for Governing magazine, where he writes a twice-monthly column on state politics. Jacobson is also a senior correspondent with PolitiFact and senior author of the Almanac of American Politics 2018. The final 2018 governor race ratings from Daily Kos. Use this as a starting point to create and share your own forecast for this year's 36 gubernatorial elections.